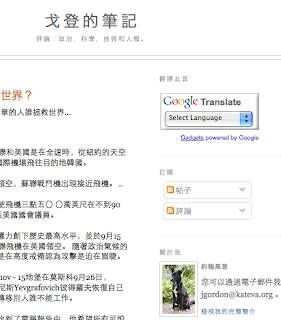 As if English weren't bad enough, my less unpopular blogs now feature a translation widget. If you try it you can see me in, say, Chinese. The widget uses Google's statistically based machine translation. It was pretty easy to install and the translation is very quick. Give it a try; ignore the eerie Twilight Zone background music you might imagine. Yes, more future shock. Not to worry, the translations are probably pretty bad. I suspect to get good results from machine translation you have to use a translation-optimized version of your native language with simple grammar, no homographs, longer words, no abbreviations, less jargon, etc. I was provoked to experiment when reading of new Google Translator Languages such as "Catalan, Filipino, Hebrew, Indonesian ...Vietnamese". Each can translate to the other, but I read that English is always an intermediary. A double translation is going to be pretty funny, but not terribly useful. I wonder if I'm better in Danish.